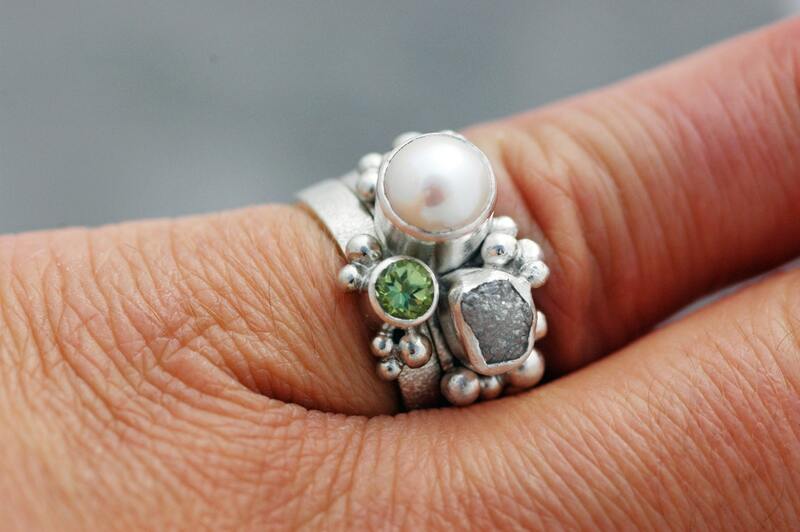 Please note: The two stacking rings you see here are sold. This is a very unique piece, and anything is possible as far as combining colours and textures. 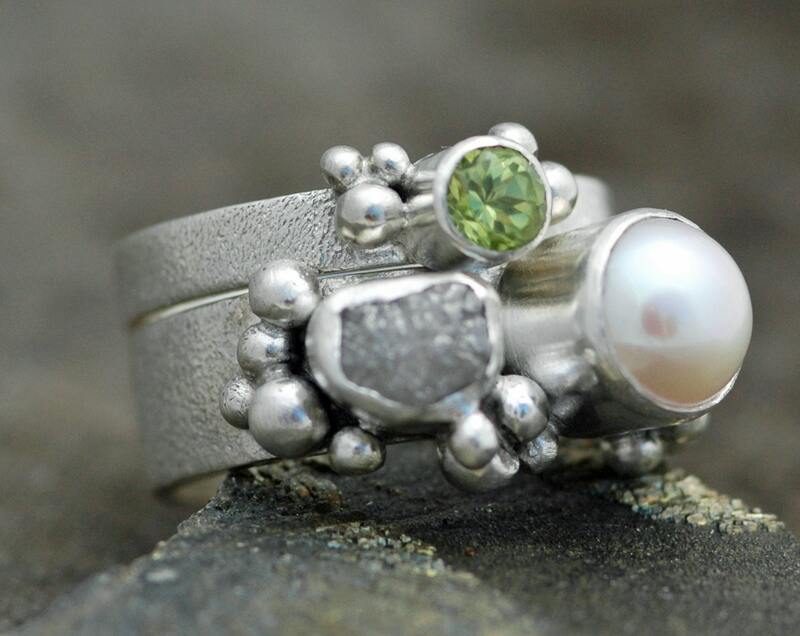 Please see my shop announcement for my current lead time on custom rings. I built these rings using thick 18 gauge sterling silver hand-forged bands. The bands were both given a pinbrushed texture. The narrower band is about 1/8" wide. Upon this band is set an apple green brilliant cut peridot, with great sparkle and clarity. A few sterling silver balls/granulation surround this diamond, which is bezel set in fine silver. The narrower band is built to be worn together with a wider, 1/4" matching sterling band. This band has multiple silver granulation. It also has a gorgeous, naturally-coloured white freshwater pearl. Complimenting this cream/yellow palette is a large, glistening, untreated translucent/white rough diamond. My rough diamonds are all conflict-free and ethically sourced. The pearl is around 6-7mm across. The rough diamonds around 5mm across. Please consider the following textures and colours for your ring- if you do not see what you are looking for here, please get in touch for a custom design. If you would like any other sort of gemstone, either semi-precious or precious, please get in touch for availability and pricing. As this listing has so many custom features, please contact me to work out your custom design prior to ordering. 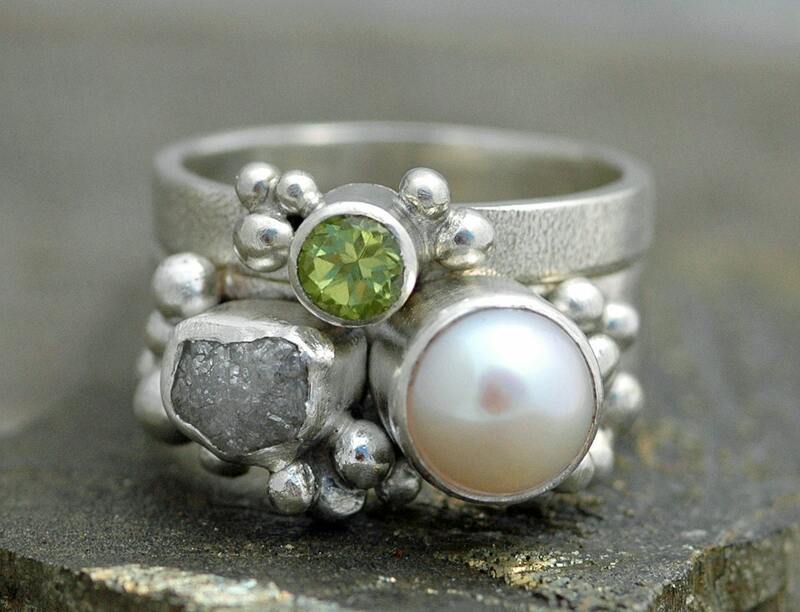 The rings are built so that they may be worn stacked together, or apart. But, please consider how you will most often wear them and read the information below about ring sizing. Ring sizing- please read: These ring sets are of very complicated construction, and are not easily resized. Please ensure you have your correct ring size for me. If you need help determining your size, I can happily help you. 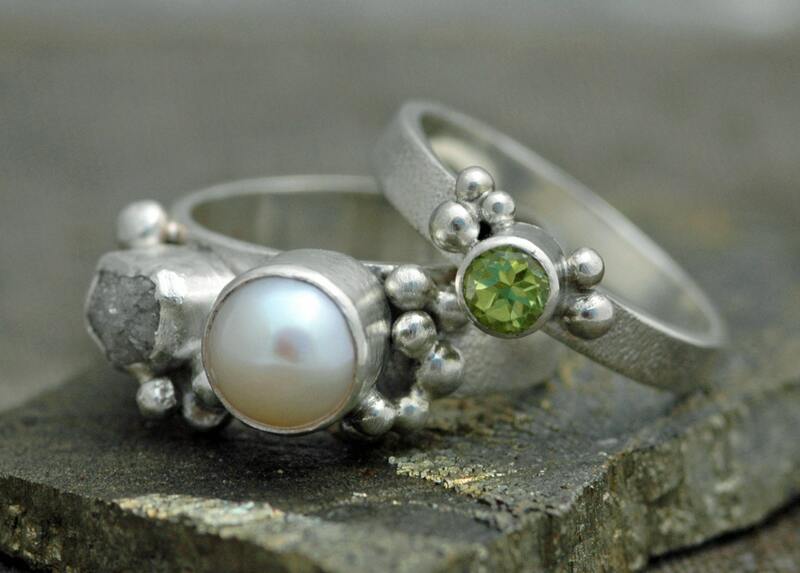 These rings will be sized to be worn together, unless you request otherwise. I will size you up approximately 1/2 of a ring size to ensure a comfortable fit, as wider bands fit more tightly. Please DO NOT give me a 'sized up' ring size on your own- I need your true, accurate ring size to ensure these fit properly. If you are concerned that you may not have your size completely correct, I am happy to build your bands and send them unadorned for a fitting. You can try them on, see how they fit, and wear them around for as long as you like- this will ensure that we have your size 100% perfectly comfortable. Please realize that the fitting period adds to my production period. 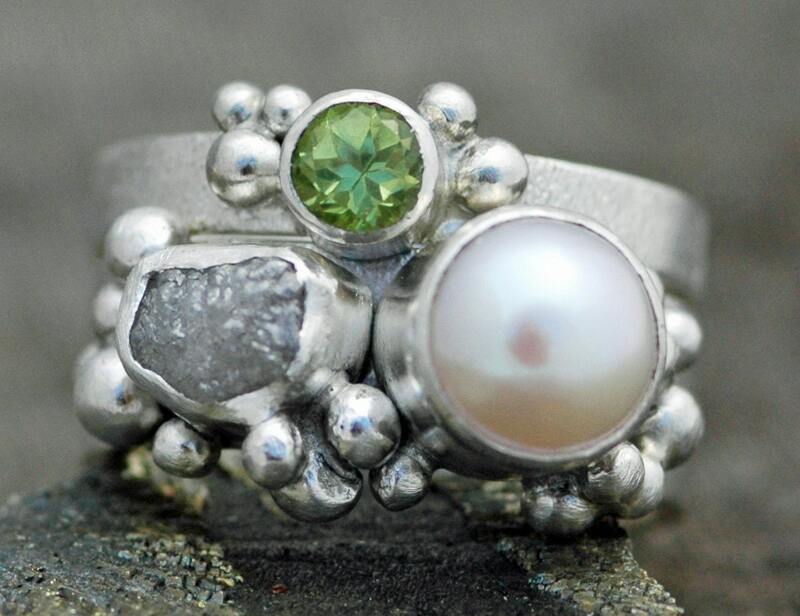 This ring set will ship using a secure two business day (to most locations, but some restrictions apply) (into the USA) courier service- either Fed Ex or Purolator Courier, unless I can find you a better rate with Canada Post. The parcel will travel with a tracking number and delivery confirmation. Insurance coverage is set at $100. If you would like your piece fully insured, you must contact me for an insurance quote prior to ordering. Please note that I am not able to collect nor estimate the import duties your country's Customs office may charge you upon delivery. Your Customs import paperwork will be properly filled out with the contents of the package (in detail), the total value of the rings, and the fact that these are merchandise.